Steve Biddle House, on Hudson Road is a modern building with 22 self-contained studio flats, as well as a Visitors Room, with their own shower rooms and kitchenettes. The building is fully adapted for wheelchair access and Wardens are on duty twenty-four hours a day. The communal areas include a Dining Room, where a fresh midday meal is served every day, a Leisure Room and a Sun Room which leads out to a terrace where residents can sit out and enjoy the warm weather. There are two assisted bathrooms and hairdressing facilities on site. Robert Stokes Almshouse, in the city centre, is the newest of the almshouse sites, having been rebuilt in 2005. Wardens are on duty twenty-four hours a day and the Warden Manager also lives on site. Accommodation comprises of thirteen spacious flats, all fully wheelchair adapted, two of which have a second bedroom. An assisted bathroom is provided as well as hairdressing facilities and a Visitor's Room. A fresh midday meal is served in the Dining Room five days a week. 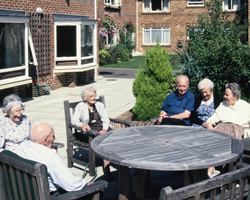 On the other two days Residents can join the Day Centre which makes use of the facilities and offers lunch to members.